My Impressions: SSS Diecember® Blog Hop & GIVEAWAY! So many great ideas for this new release! Love them! Lovely simple, clean design. great job! 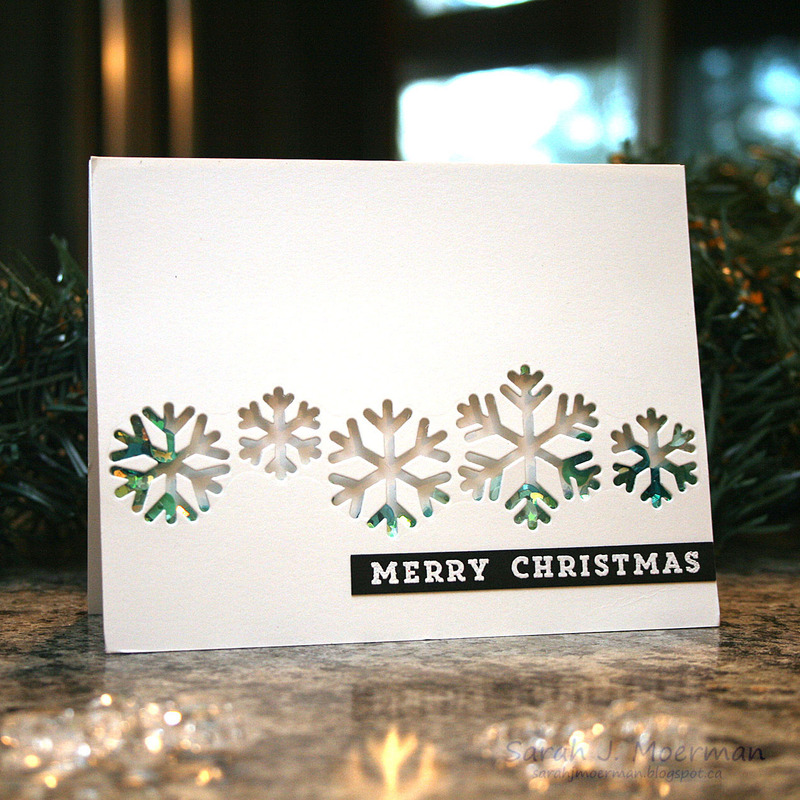 Love the clean, simple shaker card you made with the snowflake die. Hi Sarah! Thanks for sharing your fantastic cards! I really loved the snowflake shaker card! These would be fun cards to make with my granddaughter! Colorful and happy. Very pretty cards, Sarah! Love the shaker card. The backgrounds you have created look beautiful! Gotta love those distress oxides!! Also, your first card is my favorite of the lot. Streamlined and almost minimalist except for the bit of color of the snowflakes peeking out. Great design! Awesome cards!!! Love your shaker one!!! Fabulous cards. The evergreen circle die makes for a great silhouette card. I love the shaker snowflake card too. 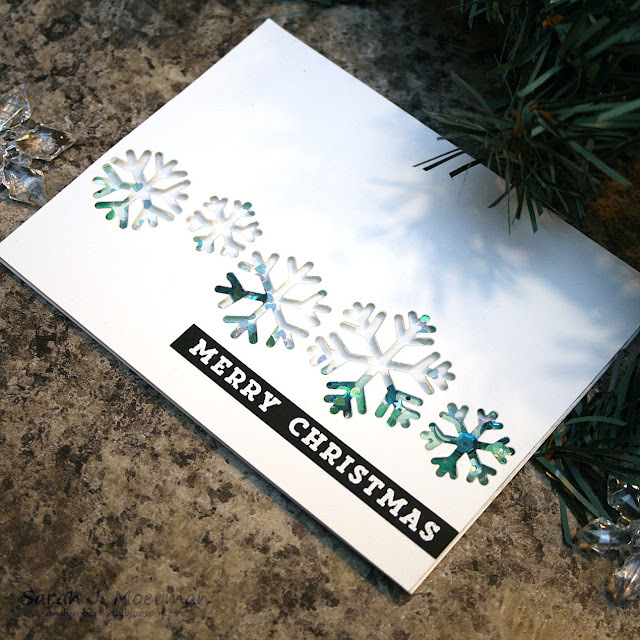 Loving the sensational snowflake dies and your cards are simply gorgeous!!! great projects. I love the snowflake shaker card and the evergreen circle. Beautiful cards. The snowflake shaker is my favorite. Gorgeous cards - love all the snowy goodness. I love the vellum layered over the snowy background the most. Awesome cards today... I love eat shaker. I love all the cards but the merry & bright is my fav. Good job and thanks for sharing. These are all lovely Sarah, I esp. like your snowflake shaker card, just beautiful. I love all three! Seriously beautiful!!! I love all your cards! Really cute! Wow love this snowflake die, your shaker card is so beautiful . Beautiful cards! love all the snowflake ones! great dies in this release. Love the little shaker snowflakes. The next card is bold and beautiful. The winter scene is wonderful. Beautiful cards! Love those scene dies! They make mass producing so much easier! Wish I had them right now. :D Loving this SSS release and blog hop! So much talent and inspiration. Thanks for sharing yours! Very beautiful cards. Love the new release! What great ideas you have for this release. Thanks for sharing. Beautiful cards! I love the shaker snowflakes card and the simplicity of the circle trees. These are gorgeous! 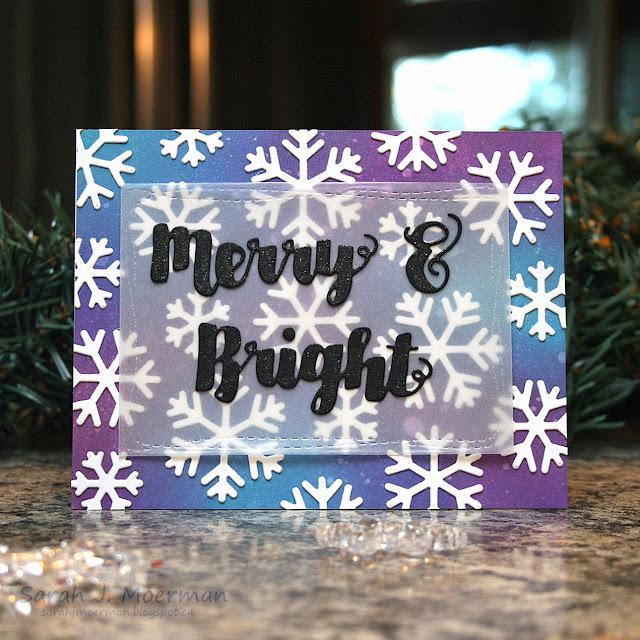 I love the snowflake shaker and the beautiful background on the Merry & Bright card. The clean and simple look of the last one gets me every time, it's lovely. Love your cards!! 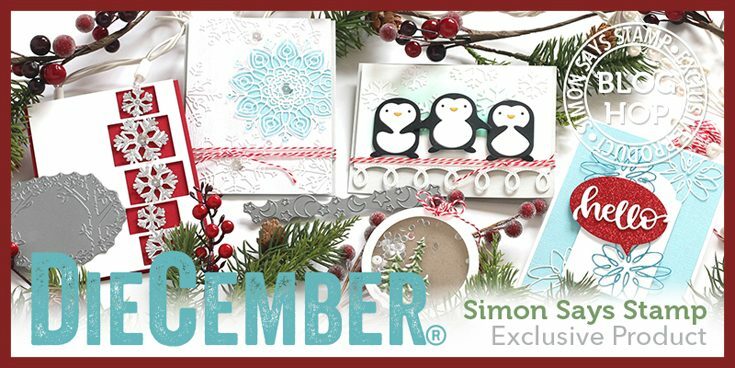 Those snowflake dies are so cool...so many possibilities & techniques to use them for in cardmaking! I like the effect of velluum and your background-color combination. My favorite is the snowflakes! Love your cards! Great cards, they are so beautiful! And those snowflakes are gorgeous!! The cards are awesome! The shaker card is my favorite. So cool. Nice cards! I always love a good snowflake die. I am really impressed with the snowflake cards you ladies are making. The shaker is beautiful. Thank you for your input! Beautiful cards. I especially like the shaker card. Wonderful cards! Thanks for the great ideas! I just love the snowflake card! So Pretty! Both cards are so lovely and festive! Love seeing the die used 2 ways. Love all the snowflakes and the peek a boo sequin is my favorite!!! So cute!! Love your snowy cards. And another great release from SSS. Beautiful and very classy! I love its elegant simplicity! Your cards are so pretty! I love Diecember! Love how the sequins peek out from behind the snowflake border die. As I have my eye on the Evergreen Circle die, I admit your CAS design is my favourite! Love your cards, your shaker card is fantastic! Your cards are great and very original. Each one is unique unto itself. Thanks for taking the time to share your creativity with us. These cards are all so different and yet all so pretty. I love the colors you used and the designs, especially the shaker card (I'm partial to shaker cards). The last card is so serene, just lovely. This is a wonderful release and you have given me lots of inspiration!! Beautiful cards-- I especially love the CAS snowflake shaker! Great cards. This release with the snowflakes and glitter papers is beautiful. Love the merry & bright card, but the evergreen circle is my favorite! Thank you for sharing these inspirational projects. Thanks for sharing your beautiful cards, Sarah. I'm also loving the Evergreen Circle die. Beautiful cards! I like the use of the vellum over the snowflake panel. Lovely! The Evergreen circle card is wonderful! thanks for the lovely Christmas card inspiration, Sarah - all these new dies are so fantastic!! All your cards are lovely! I especially like the one with the tree silhouette. The cards are beautiful. They give you a sense of peace. I love your beautiful cards! Thanks for sharing and for the chance to win! Love the cards! Thanks for sharing your ideas! I love the different ways to use the snowflakes! Great cards. The tree cards looks very serene. All of your cards are beautiful!! What a great way to showcase different ways these dies can be used!! I love it when you can get a two-fer like that! COOL shaker and gorgeous night sky!! Love the snowflake die and Merry Christmas card! Thanks for sharing your lovely cards. Hard to pick a favorite die but would have to say Felicity snowflake....or maybe the collage dies...just want them all! There are so many different ideas with your cards, but I love the one with the tree and wishing a season of great joy. Simple but has a pretty softness to it. I like your snowflake cards. So beautiful. And the one with the trees was gorgeous. Beautiful cards, Sarah! Love all the dies - so much fun! Beautiful cards; those snowflakes are wonderful, but so is that last card! So beautiful>>> too bad Diecember only last this month! Happy snowflakes cards and dreamy trees card. Wonderful! Beautiful cards. Love the simplicity of the last one. love the way you created two cards from one die cut session using the negative and the positive of the die. Very fun cards. Such a wealth of ideas for this release. Such a pretty shaker snowflake card. I love the background of your Merry and Bright, such a pretty card. Love the simpleness of your Christmas trees! So pretty! The evergreen tree circle with that spectacular background is a winner! OH so much beauty on your blog with this line up of holiday cheer! I love the forest card with the winter snowy sky - sensational! that circle tree die is stunning with that background. Love your cards. The simplicity enhances the adorable dies in this release. Thanks for sharing. Love the merry & right with the vellum. Stunning! Great cards, all of them, I love the snowflake strip but many many great new dies from SSS! That Sensational Snowflake Die shaker card is so cute, Sarah! Great cards, I love especially your first card, just gorgeous. Thanks for this inspiration. You created very beautiful cards. So pretty, all three, and I can't pick a favorite. I think they are all CAS elegance. Love the snowflakes die. Your cards are beautiful! Gorgeous cards and great dies. I love them all. Thanks for the inspiration! Nice cards. I like the one with the snowflakes. The cards are so pretty. Shake a flake! Such lovely cards! The snowflake shaker card is really great! And I love that Evergreen Circle die! Oh I want all of this wonderful DieCember Release!! I've got to try shaker cards! You all are making such beautiful ones. I love the way you used the diecuts as well. Wonderful designs! Those are all very, very, VERY nice! I can’t even choose a favorite (which is unusual for me!). Lovely cards! Love that shaker card. Great cards. I love the snowflakes! I love your cards! The snowflakes are so pretty. Wonderful cards (but I really love your tree too!) Nice job with all these fabulous new dies. All of your cards are beautiful. I really love the evergreen circle die from this release and I especially love your card! Your cards are beautiful. The one using the evergreen circle is so stunning. Pretty snowflake cards and I like yesterday's card with the evergreens. Your three cards are really beautiful. 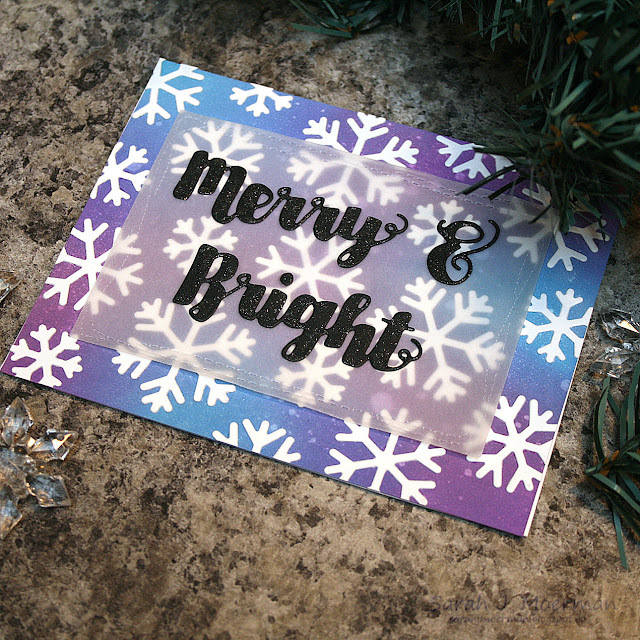 Love these oxide dies and snowflakes! All your cards are beautiful but my favorite is the snowflake shaker card. Wow, lots of lovely cards you've made with the new release. Beautiful cards! I love the trees! Both cards are lovely, love the snowflake shaker card. Your cards were so pretty, that last one was so beautiful. Thanks for sharing. Tracey Magner. Beautiful cards! Love the snowflakes and the pretty tree scene! Very creative cards, and very cute! Beautiful cards, love the shaker! Love that snowflake die shaker card. It is so beautiful!! Your cards are all beautiful but that shaker card is amazing!! Really Beautiful cards!!! I love the tree card!! extra luv your second card! loved your cards. the shaker card was amazing....the colors of the sequins were gorgeous. loved the evergreen circle card. you are very talented...keep on inspiring all of us. Beautiful cards. I so love snowflakes. Great release. Have to have MORE SSS snowflake dies. HA! The stitched vellum gives it a nice touch! Good idea about the vellum and that stitched die for it Sarah. My fave is the circle with the evergreens against the starry night... wonderful!!! Wow, what beautiful cards! I especially love that last one. Such a beautiful winter scene you created! These are fantastic - thanks so much for sharing! Beautiful cards, I especially love the Merry & Bright snowflakes card! Great shaker! I love the little evergreen tree card. I love your cards, Sarah!! The shaker card has my heart! Such a clever way to use dies.. I always tend to waste the negative space! I just love the clean & simple elegance of the two white cards & then the bright exuberant colours on the middle one you showed. Thanks so much! Super easy cards are very nice to have if you run out of cards to send. I love your cards. I think I will be able to recreate them when I get my dies. Thanks for sharing and have a wonderful weekend! Nice cards! This is such a fun release from SSS. Thanks for sharing!! Beautiful cards, Sarah! I especially love the shaker! You've just reminded me I haven't made one in a while and I think I need to remedy that! Great release for Die-cember! I really like the card using the new evergreen circle die. I've got that die on my wish list along with the snowflake dies. Like the shaker style, use of the vellum & glitter and more. 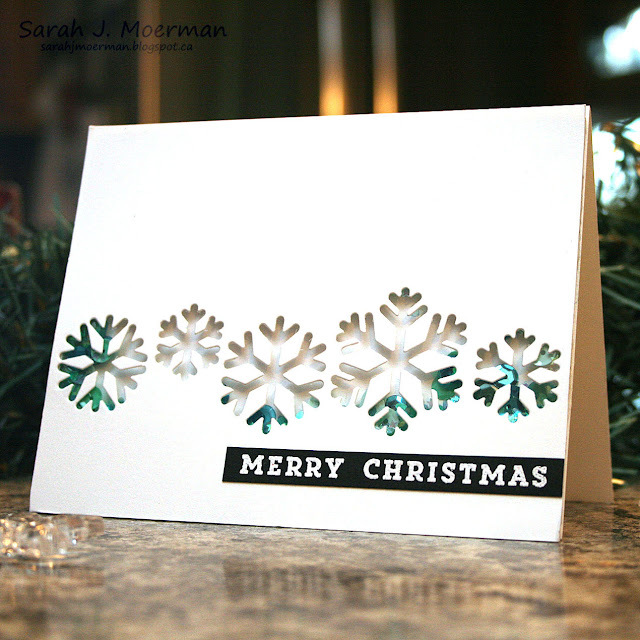 Sarah, your snowflake shaker card is so clean and fun! Your tree card is really beautiful and I love the sentiment. Unfortunately, I can't find that set of sentiments on Simon Says Stamp. The background for the tree card is so pretty! thanks for sharing your creativity with us! What wonderful cards. I love the snowflake shaker card. Unique. I love your snowflake shaker card! Thanks for sharing your talent with us. Nice and clean, very pretty! I'm so glad you used the evergreen circle die, because I was wondering how it looked in proportion to a card. And while I enjoyed all your cards (those green/teal sequins were a particularly nice touch), I think I liked the evergreens the best. It's so perfectly winter for me: snow-covered trees on a dark night. I can almost feel the cold, but in the best way. There is just something about inked backgrounds that I just love. You can do so much with those and you've done a great job using that combined with great SSS products. Thanks for sharing! Pretty cards. Love the shaker card! I really love your cards! Thanks for sharing! These cards so magnificent. I love the design here. Beautiful cards, but as I live in Maine the card made with the evergreen trees die is my favorite! It looks like I'm not the only one loving the shaker card...but, then again, I love vellum. What's a girl to do? CASE both, I think! ☺ I really like the non-traditional blues in the cards. It's fun to mix it up a bit. Thanks for the great inspiration. I like your cards but my favorite is Merry & Bright because you stamped on the vellum. I can't tell how you attached the vellum. I can’t get over how the Evergreen circle die made that simple card so stunning. Thanks. That circle with the trees is simply stunning (one of my favourites of this release), and your card with it is beautiful! I also love the shaker with the snowflakes - very effective! All your cards are amazing but my favorite is the last one. The white trees against the dark night sky is gorgeous. Love that sentiment too. 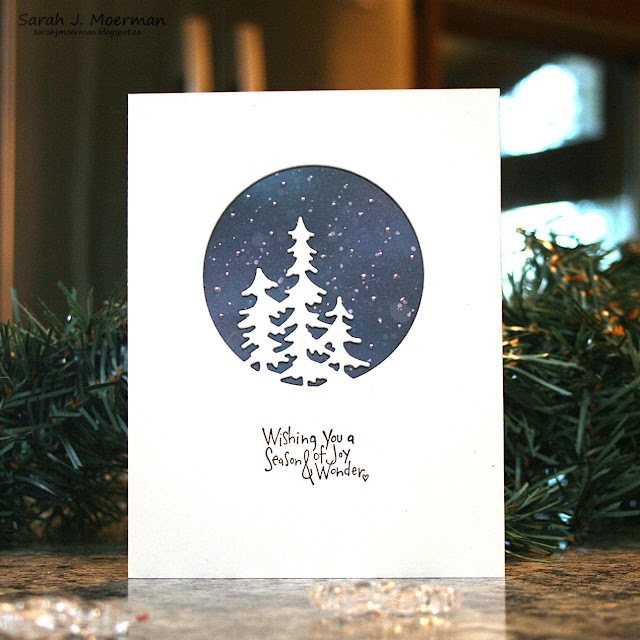 I love the snowflake background and that tree die cut is perfect for Christmas. Lovely cards. I love your background on the tree card. Gorgeous cards, Sarah. I particularly like your CAS shaker with a pop of teal peeking through. I really like the clean designs of your cards, especially the simple elegance of the shaker card.